ADOM ("Ancient Domains Of Mystery") is a typical RPG, in which you play an adventurer of a variety of classes (including Elementalist, Farmer, and Necromancer), from a variety of races (human, assorted types of elf, troll, and many more) who must explore vast dungeons, a sprawling wilderness, wilderness towns, lost caverns, and the like, acquiring wealth, magic items, and power beyond measure. Oh, and you're an "@" sign, the monsters are all letters (o for orc, D for dragon, and so on), and the map is made of dashes, dots, and equal signs. 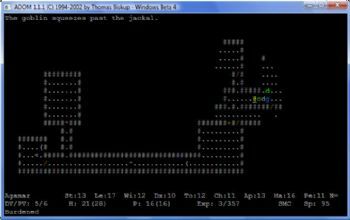 ADOM is one of a category of games known as "Roguelikes", after Rogue, the great-granddaddy of them all. It shares several traits with these games: It's huge, containing dozens of hours of gameplay. The dungeons are (mostly) random, with a few fixed levels here and there (for example, the Arena and the Dwarf City). All graphics are represented as ASCII symbols. And the game is very, very, unforgiving. There are no save points here. If your character dies in play--and you weren't "cheating" by copying the save file--he's dead. Hours or even days of play, reduced to a terse entry in the ever-growing memorial file. Some characters won't even make it to the first town or dungeon--a random wilderness encounter can reduce your Halfling Archer to a red smear two steps in. No reflexes are needed here--the game will patiently wait forever between keystrokes--but cunning, daring, and tactics are, as is careful exploration and experimentation. You find a wand--what does it do? You won't know unless you find an Identify scroll (which, itself, must be identified! ), or until you zap something with it. Perhaps what you zapped will die--it's a wand of lightning! Perhaps nothing will seemingly happen--you may have found a wand of light and used it in a lit room. Perhaps the monster will turn into a more vicious monster. Who knows? At least, once you've identified something, it stays identified, until you're dead and everything re-randomizes. Of course, you might accidently read a Scroll of Amnesia and forget all the things you've identified. Starting to get the picture? With no resources spent on pretty pictures, the game is able to layer depth onto depth onto depth. There are many side quests, most of which are very challenging--good luck rescuing the puppy, kid, you're going to need it. You can easily lock out or miss entire sections of the game by choosing one path instead of another early on. But don't worry--you'll be replaying the opening part of the game a lot. Characters die easily, and making it even to the double-digits of levels should be considered a triumph. If you have enough imagination to turn an "@" sign into a bold hero and a D into a dangerous dragon, download ADOM now.